For three years the Gang was unable to get together. 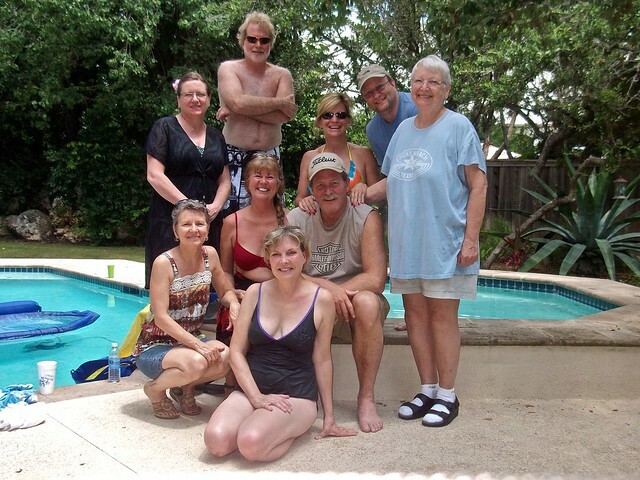 Then in the summers of both 2011 and 2012, we all met at the McColley home in San Antonio, again because of their generosity. All the same elements were brought together again: games, music, food, beverages, and friendship. 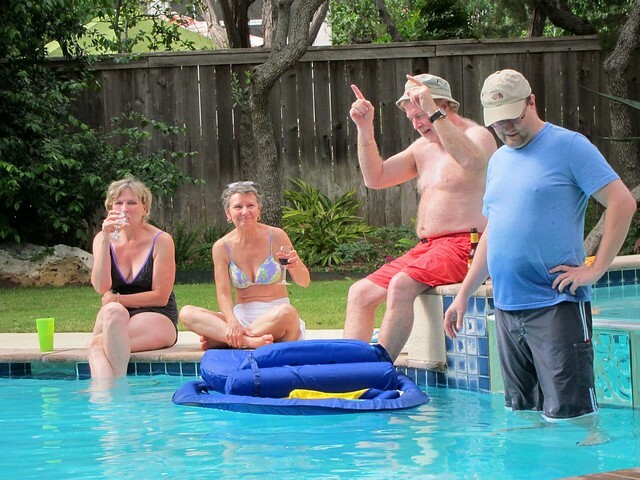 To view a slideshow of the Texas Gang’s 2011 or 2012 activities and antics during those San Antonio summer weekends, click on any photo below. the beloved dog I sit with. Front: Shelley Penrod. Middle: Jody Emerson, Sheila Alexander, Mike Ross, Joy Dean Lee. Back: Helena Abbing, Bill Alexander, Julie Gras, and Dan Thomas. 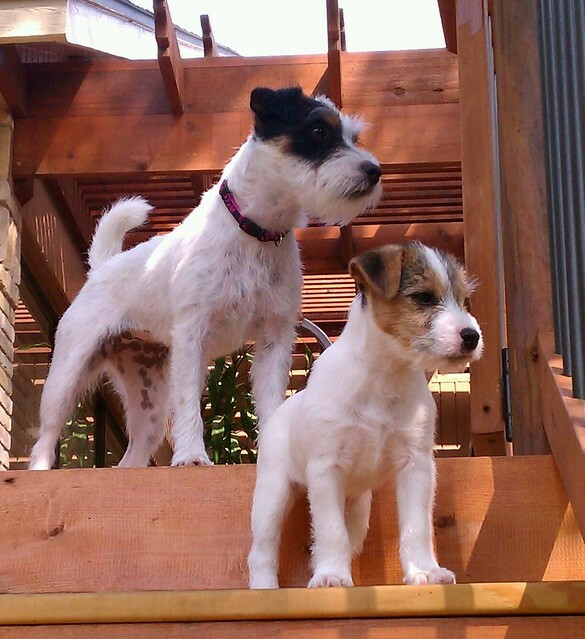 Parson Russell terriers are very active dogs…this I learned during a house/pet-sitting job in San Antonio in late May. Pazzo and Enzo are the delightful critters that kept me entertained for a week. Actually they rested much of their time on the couches, except when surveying the neighborhood to make sure all was safe and that no one was entering their domain, which should be defined as their backyard and that of all the neighbors. Not quite ready for sleep. Yes, we know that we’re very cute. They tricked me a few times the first day with their whining as though they needed to go outside for necessity. There was necessity all right: deer were within their ability to either see or smell and going outside to chase the deer was all they had on their minds. 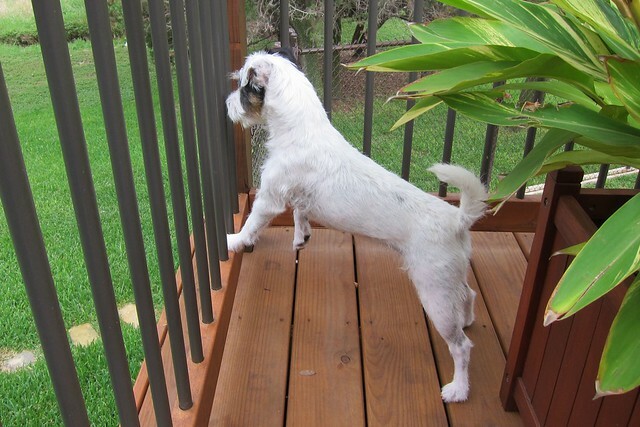 Actually, standing on the deck barking ferociously or hovering near the fences in the yard while straining on their leashes was the nearest they could get to the deer. Our nights together were special, too. Because I’m a light sleeper, I placed a large pillow between the dogs and me. After several minutes of pointing and giving a “Sit” command, they would lie down on the other side of the pillow. However, before the night was over, I’d wake up and find one or both of the dogs snuggling next to me. Even if I’d had a brick wall between me and them, they would have crawled over. Pazzo and Enzo were truly lovable and loving dogs. I’m delighted to have spent time with them. 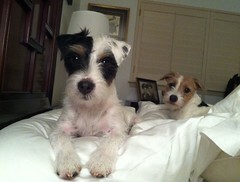 To view a slideshow of Pazzo and Enzo, click on any photo. If info about the photos is not displayed in the slideshow, click Show Info. Enzo in the hunting mode. Pazzo in the hunting mode. I’d toured the Steves Homestead in the King William District in San Antonio a few years ago, but I wanted my friend Doris to enjoy this slice of San Antonio history also. The home is quite beautiful and furnished with period pieces, many belonging to the Steves family. In addition, it was “…one of the early natatoriums, or inside swimming pools, in San Antonio” according to their website. 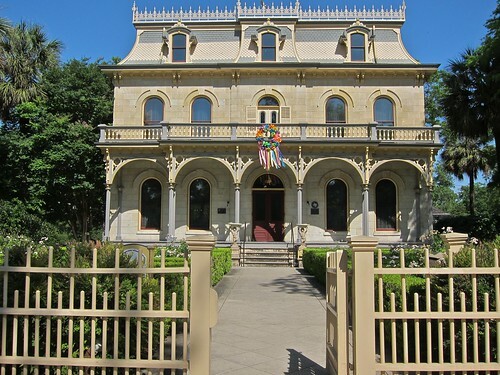 For further information on the Steves Homestead, go to (http://www.saconservation.org/tours/steves.htm). Another reason for my interest in the Steves Homestead is that my friend and former student, Becky (Drew) McColley, is a docent for the home. 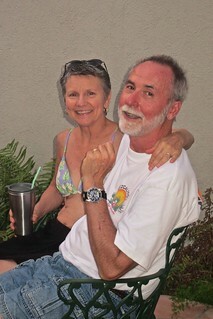 To view a slideshow of the Steves Homestead, click on the photo. If info about the photos is not displayed in the slideshow, click Show Info. 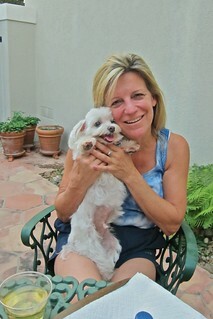 House/pet-sitting for the McColley family in San Antonio has long been one of my favorite tasks. Max (their Maltese) was the first dog I spent an extended period of time with and he became the “love of my life.” With the years that have passed, I now have innumerable pets that I love dearly. When I recently stayed with the boys, numerous photo ops popped up for me to experiment with my Canon PowerShot S95. Note: I‘ve just completed writing the index for Your Camera Loves You by Khara Plicanic (Peachpit Press) http://www.peachpit.com/store/product.aspx?isbn=0132776308 and was attempting to apply principles from the book. 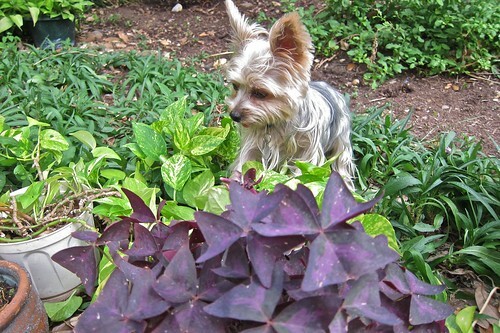 Pip, a Yorkshire Terrier, has joined the family although he is technically their daughter Kat’s pet. Pip has an entirely different personality than Max. He’s a hunter which is reflected in many of the photos I took of him. 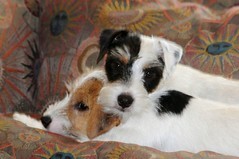 To view a slideshow of Max and Pip, click on any photo. If info about the photos is not displayed in the slideshow, click Show Info. Comfy and Cozy. 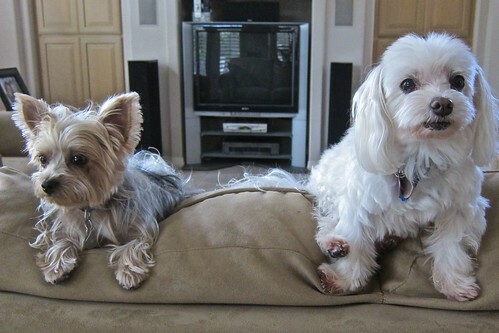 Max and Pip recline on the back of the sofa in one of their numerous relaxed poses. 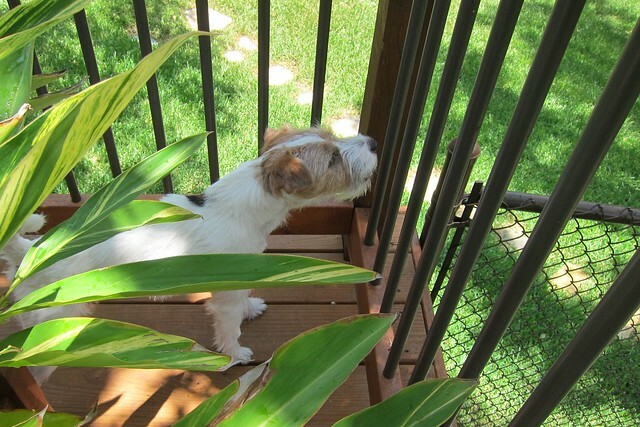 Hunter: Pip’s mission in life is to check out every flower pot, drain hole, rock pile, doormat, bush, and tree for any critters that might hide there. He even tries to tree squirrels. 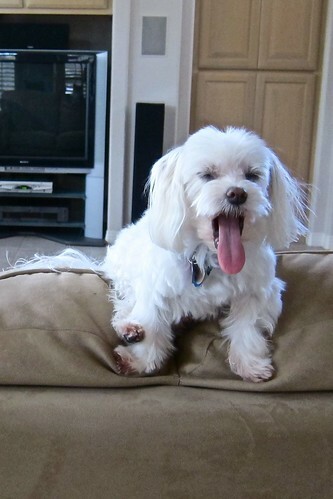 Now that’s a yawn. Max shows his contentment; he’s ready to relax on HIS place on the back of the sofa. To see a slideshow of Max as he’s mingled with my friends and me over the years, click on his photo. Use your Back arrow to return to the blog. Relaxing on the back of a sofa, whether at his San Antonio or Lake McQueeney home, is Max’s favorite pastime. 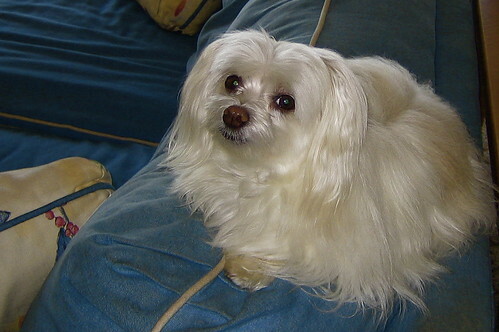 This Maltese, Max, has been one of my best buddies since I met him and began caring for him and the home of his owners in the summer of 2003 when the family traveled to Australia for three weeks. Since that initial house/dog-sitting with Max, I have returned to San Antonio and to Max two to four times each year. I’ve renewed my friendship with Max’s mom Becky (a former journalism student of mine) and have learned to love the entire family and their many talents. I’ve watched the daughters mature and go off to college. I’ve also renewed my friendship with Becky’s parents and her brother, who was also my journalism student a few years ago. Becky and I have traveled to Ireland together two consecutive years, 2004 and 2005. The tales of her meeting a group of people in O’Conner’s pub in Doolin, County Clare, Ireland, the first time she traveled to Ireland and the fact that she became good friends with these people convinced me that I must travel there. Those friends warmly accepted me. I plan to post the photos of those trips later.